Last week I told you about the birthday party that we threw for our friend. As much as I wanted to celebrate her birthday, I selfishly also wanted to throw the party so I could make a cake. I love making cakes and I just don’t have very many opportunities to do it. When I find an excuse to bake, I take it! Mandy, the birthday girl, didn’t have any special requests for her cake. Just something sweet. With no requests, the possibilities seemed overwhelming. Of course I thought of several chocolate cake variations, but I do a lot of chocolate desserts, so I decided to take the road less traveled (for Jesse and I anyway). I am really happy that I decided to go with this non-chocolate cake. It was a nice light finish to our burrito bowl dinner and it was so pretty. I did make a last minute decision to not use Swiss meringue buttercream (SMB) frosting. In the US, I’m not afraid of the eggs in SMB at all. I know the eggs in the US are safe. I am not as confident in the eggs here. I buy eggs from the refrigerated section but I’ve seen the same brand at other stores not refrigerated, so I’m not convinced they are kept that way through out shipping. I also know that in other countries it’s common to not keep eggs in the fridge. For just Jesse and I, I honestly wouldn’t put as much thought into it, but I was having 10 guests. The thought of a bad egg and all my guests getting sick – eek! Not a risk I was willing to take. Anyway, SMB would be a great choice for this cake. The fluffy vanilla frosting I used also worked really well. I’ll leave a link for both recipes and you can decide for yourself! Also, I went grocery shopping with the birthday girl the night before the party and she picked out her favorite fruits for the top of the cake. Most any variety of fruits would work! The recipe I used called for a glaze over the fruit, but I didn’t want it to be too sweet so I skipped it and it was fine. Preheat oven to 350 degrees. Prepare two 9-inch round cake pans with parchment paper, butter, and flour or a non-stick baking spray. Sift together the cake flour, baking powder, and salt. Set aside. In a seperate bowl, whisk together the egg whites and milk. Set aside. In a large bowl or standing mixer with paddle attachment, beat the butter until smooth and creamy. Gradually add the sugar and beat until light and fluffy. Scrape down the sides of the bowl, then add the vanilla and beat to cobine. Alternatively add the flour (in 3 increments) and the egg mixture (in 2 increments), beginning and ending with the flour. Beat on low-medium speed after each addition, just until combined. Divide the batter evenly between the two cake pans. Bake for 35 minutes, or until a toothpick inserted in the center comes out clean. Allow to cool in pans for 10 minutes, then flip out on to a rack to cool completely. In a large bowl, beat together the butter and sugar until light and fluffy. Add the eggs and egg yolks one at a time, beating well after each addition. Add the lemon juice and beat to combine. Mixture will probably look curdled, that’s ok. Transfer the mixture to a saucepan and cook over medium-high heat until the mixture is smooth, and no longer looks curdled. Slightly increase the heat and cook until the mixture begins to thicken. Clip a thermometer to the side of the side of the pan and cook until it reaches 170 degrees F.
Transfer to another bowl and cover with plastic wrap, press the wrap into the curd to keep it from forming a skin. 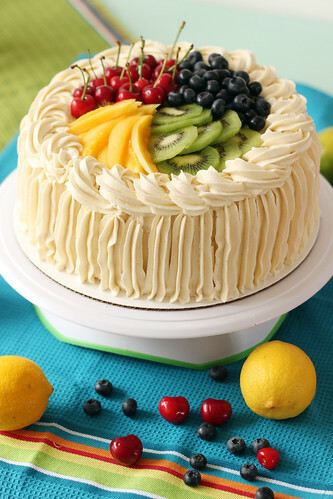 Refrigerate until completely cool before filling cake. Place one of the cakes on a cake stand or cardboard cake round. Pipe a line of frosting around the edge cake. Fill the outline with the lemon curd. Place the second cake on top. Give the cake a coating of frosting. Using a star tip, pipe frosting in upward strokes all the way around the cake. Pipe an outline of rosettes along the outside edge of the top cake. 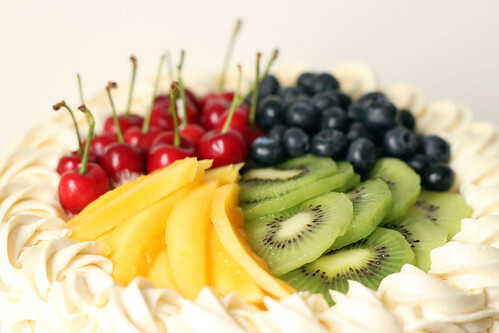 Fill the middle with fruits of your choice. Gorgeous cake! It looks like it should be a display cake in a fancy restaurant. Gorgeous cake! I LOVE lemon curd. This is so beautiful! You did an awesome job. 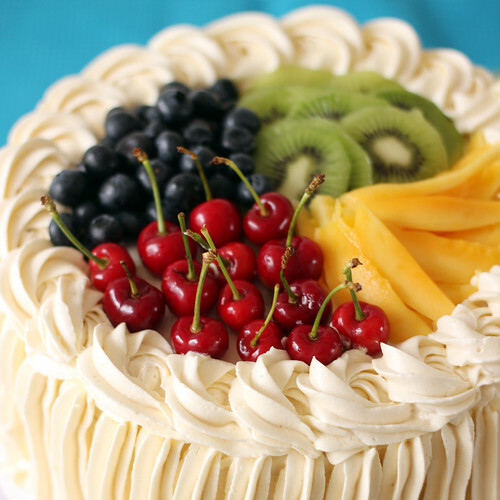 This cake looks so perfect. Wonderful work!